Raised spirals appeared on jade works from the sixth century BCE onward; over time they were lined up in a diagonal row "grain" pattern. The design may have symbolized the cereal grains presented as offerings in religious ceremonies or they were an abstracted version of earlier C and S-shaped scroll patterns. The clockwise and counterclockwise spirals strikingly reflect light when the disk is moved. 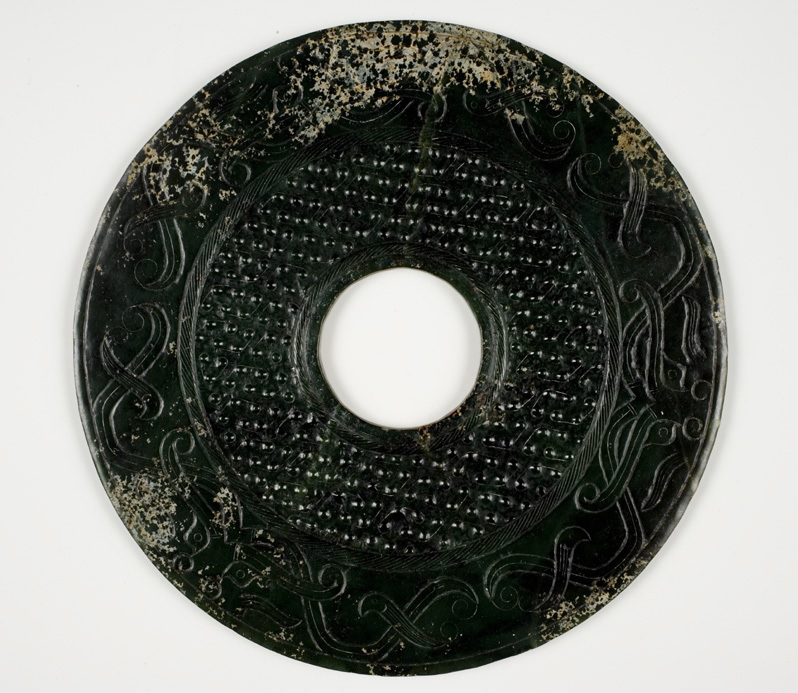 Many large, dark green Eastern Zhou dynasty disks have been found in Han dynasty tombs. Both sides of this disk are decorated with plain, evenly spaced protuberances linked by incised lines, a design which had evolved from the earlier, livelier spiral "grain" motif. The incised design of bovine masks, flanked by snake-like extensions, masterfully imitates the ornamentation of gold and bronze works and openwork jade pendants of the Eastern Zhou dynasty.